Those of you who are American football fans are of course fully aware that last night Peyton Manning broke Brett Favre's career record for touchdown passes. By the end of his play he had added another as well finishing the night with 4 touchdowns and with 510 for his career. Of course, the Denver Broncos General Manager and Executive Vice President of Football Operations is John Elway. Elway captained the Broncos to five Super Bowl appearances of which two were victorious - and also had 300 career touchdown passes (fifth all time in the NFL). Manning thus far has three career Super Bowl appearances - one with Denver and two with Indianapolis, however his only victory was with the Colts. The following is a brief nonverbal analysis of John Elway captured immediately after Peyton's record 509th touchdown pass. 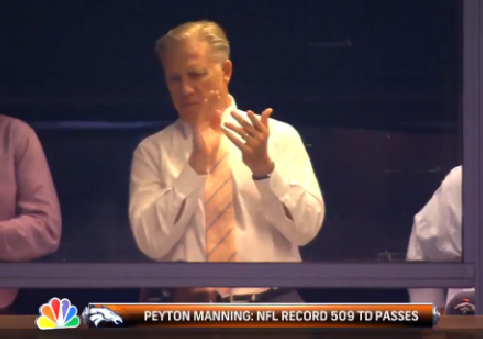 Obviously, Elway is clapping in the image above as well this second photo which shows his final clap - which is very conscious body language behavior. Evaluating his face however, even at this low resolution, we can see his thinned lips, an inward lip roll (partial), downward directed mouth corners, his mid-face tension, nostril flaring, eyelids partially and tightly closed, downward vectored eyebrows and, in the first image above, we can see the eyebrows are pulled together as well. This nonverbal facial cluster configuration is consistent with anger-disgust - and is subconsciously generated. Here all the above facial features persist with the exception of the addition of a greater degree of inward lip roll - consistent with a subconscious attempt to suppress his negative emotions - as his hands go in his pockets. When a man puts his hands in his pockets (with the exception of deliberately posing for a picture) - it signals lower levels of emotional comfort, lower confidence and disengagement. 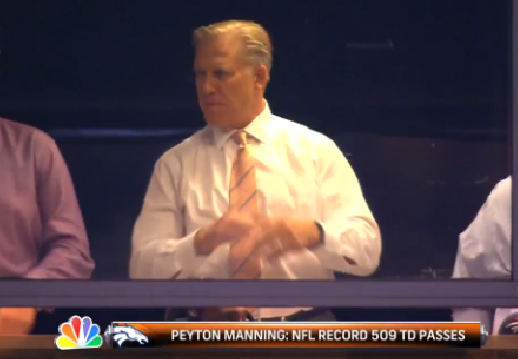 Here Elway is a turtle wanting to go into his shell. 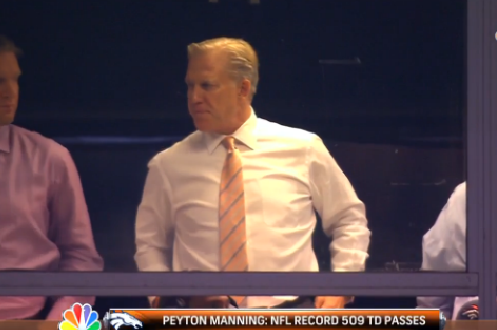 In this moment Elway's hands are fully inside his pockets - with the expression of disgust very clearly demonstrated. 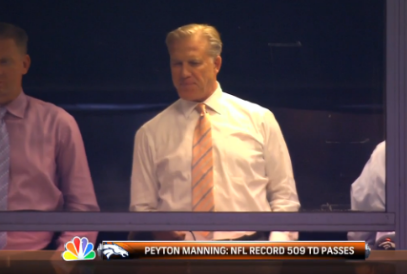 In summary, John Elway has anger-disgust during the celebratory moments of Manning's record breaking performance. Although other possibilities exist, the context of this moment strongly suggests these emotions are either self-directed - e.g. Elway is feeling he could have and should have done better in his career - or they are being projected at Peyton Manning as a manifestation of jealousy. It is also profoundly important to note that whenever a conscious body language act (e.g., clapping) is seen with unconscious nonverbals - it is the unconscious behaviors which betray the true emotions. Gloss over this caveat at your peril.